I simply adore this fresh & healthy meal it is packed with so many vitamins & doesn’t involve any cooking. This meal only takes minutes to prepare & it only has fresh raw ingredients. 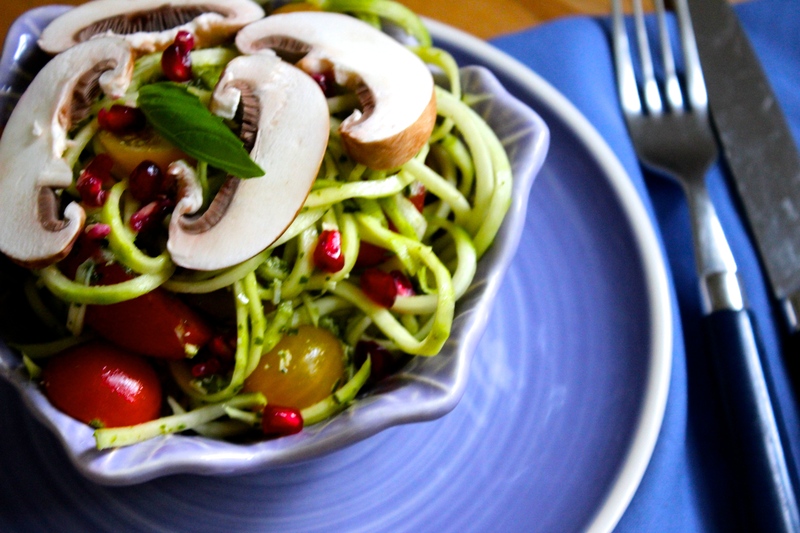 Using a spiralizer or a vegetable peeler, cut zucchini into angel hair-like pasta, and place in a bowl. Drizzle with a very small amount of olive oil, seasonal tomatoes, & shiitake mushrooms. Simply toss with my Raw Basil Pesto & season with sea salt and black pepper. I like to decorate with a sprinkle of fresh pomegranates and serve. Zucchini (courgette) is a very low calorie vegetable & is an excellent source of dietary fiber & potassium. They are incredibly versatile & can been eaten raw or cooked. They actually fall under the umbrella of summer squash, which are squashes that get harvested before their rinds harden- unlike pumpkins & butternut squash. Zucchini is a good source of potassium, which is an important intra-cellular electrolyte that helps to reduce blood pressure & heart rate by its countering pressure effects of sodium. It’s also rich in vitamin A & C, along with magnesium & moderate levels of b-complex group of vitamins like pyridoxine, ribofoflavin & thiamin. Consuming raw zucchini increases your intake of dietary fiber, and because of their vitamin C levels, they are great anti-inflammatory foods. Zucchini also provides folate, a vitamin needed to break down the dangerous amino acid homocysteine, which – if levels in the body increase can contribute to heart attack & stroke. They are a fantastic raw, healthy replacement for pasta. They can be eaten raw or lightly sautéed depending on your preference. I coupled them with seasonal tomatoes, which add a flourish of colour and also have so many benefits due to their excellent levels of phytochemicals such as lycopene. They are a rich source of vitamins A & C & folic acid. Vitamin K & calcium in tomatoes are both good for strengthening & repairing bones. Lycopene also has been shown to improve bone mass, which is a great way to fight osteoporosis. I used raw chestnut mushrooms as a topping because not only are they delicious & they are now considered a “super food”. Research has shown that cultivated mushrooms contain biologically active compounds, which scientific studies suggest may have potential to help fight cancer & heart disease & improve well being, although more research is needed in this area. I used Pomegranates as a garnish as they are a good source of fibre. They also contain vitamins A, C & E, iron & other antioxidants. This is such a quick & easy recipe to make if you are short on time & want something quick & super healthy to eat. Raw muesli and zesty ginger balls.